Cody Bazzle's buck was a 6 point! Sarah Case got her first one with velvet. BUCK OF THE WEEK buck to beat is Adam Bernshausen's dressed wt. of 124.9 lbs. He's the winner for the Killer Breakfast unless someone comes in with bigger tonight or tomorrow night! Shane and Kim Weeks drove quite a while to bring us this big buck! First of the private land gators! 10 ft. 4 inches from Nemours Plantation. Adam Bernshausen's buck was an 8 point with a kicker and weighed 195 lbs. on the hoof. Want to know every time we post a new picture? We can send you an email informing you each time the blog is updated. Facebook is supposed to post the blog under Notes on our FB page, but it keeps bouncing us off and sometimes misses posts.From what I can tell, it's because we post so often. But as long as you keep bringing in these awesome bucks, we'll keep posting! So to be sure you don't miss a thing, scroll down the column at the right. The sign-up email link is below the Facebook badge. Matt Alexander's buck weighed 183 lbs. and had an 11 inch G2. We hear this all the time. If a buck has an injury on one side, his antlers will show an abnormality on the opposite side. This buck's palmation is on the opposite side of this missing toe. We've started keeping an eye on it and it really does happens quite a lot! Chris Dupree got this buck during the day! YUM! Brandy and Bo love Cordray Farms Beef Bones! We have shelled corn for $10 a bag. Adam Gochnauer's pig with the bow! Jeremy Muckelvaney's first with the bow! All natural raw Cordray Farms Beef Dog Bones and Dog Food! We have both the bones and dog food available right now. The meat is $2 for a 1.3 lb. frozen chub. Raw bones are in 4 to 6 inch sections and are $1.00 per lb. Like all our beef, these are made from all natural beef raised with no added growth hormones, antibiotics, and are pasture raised here on our farm. I'd love to hear from you with your experiences and opinions on feeding raw for your pets! We've restocked the Cordrays Farm Beef! 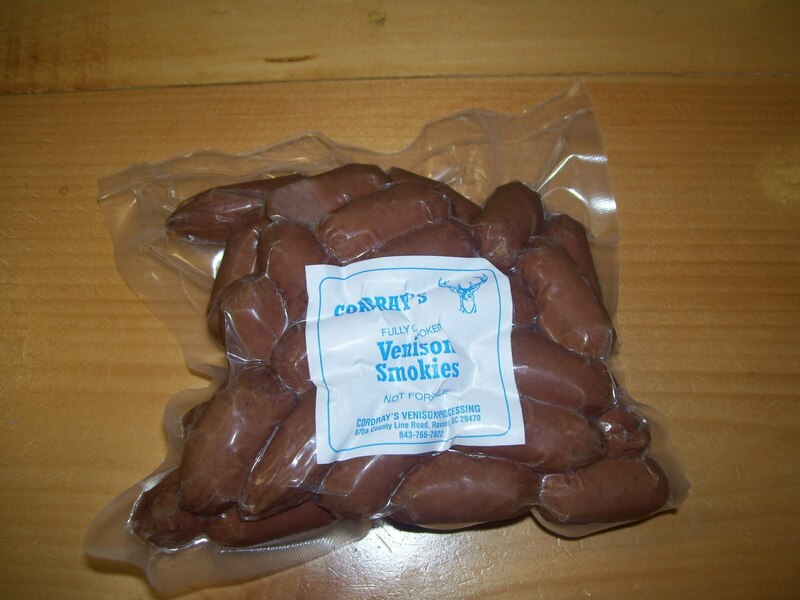 Just wanted to let you know that we've restocked the case with plenty of fresh, never frozen Cordray Farms Beef! We cut some especially thick T-Bones and Porter Houses, as many of you have requested. We have briskets, beef back ribs, and bone-in sirloins, too! In addition to all this fresh beef, we've got smoked sausage with cheese and jalapenos, summer sausages, and snack sticks. Applewood smoked bacon, cheese, and Cordray Brothers sausage winds up the list! Our busy time for deer and alligators is just around the corner, so stop in soon! We have the best selection we'll have all year, right now! We also cut 8 Cordray Farms Beef Shares. As most of you know, we usually keep a waiting list through summer. But for now, you don't need to get on the waiting list, just stop by. We are 9 am to 10 pm, Monday - Saturday and Sunday evenings from 6 pm to 10 pm. ****As I was writing this Michael came by and said he has one Beef Side that he can sell. If you are ready to give him cutting orders for that, call today. Otherwise, he'll probably cut 4 more Cordray Beef Shares. If there is something special you're looking for, just give us a call. Most of you heard that our yellow lab, Suzie, died over the summer. So the new watchdog-in-training is Brandy. She's an Australian Shepherd. She's supposed to learn how to move the cows from place to place and guard the farm at night. So far, she can sit and stay and run after the chickens and ducks like a madman! When she comes up to you receive her pats - she thinks you all come out here just to pet her - please help by not letting her jump up on you. It's cute now when she's a 7 month old, but in a few months when you stop by on your way to dinner and she greets you with muddy paws on your khaki pants, "cute" won't be what you're calling her! She loves to chase a ball and more than a few customers have succumbed to her charms and thrown it for her. So say hello to Brandy when you stop by! Larson Walker, Jack Bennett, and their buddy got a pile of pigs! Jordan Singleton picked up his Cordray's Taxidermy tanned hide yesterday! Remember, to claim your prize you must pick it up within 7 days of your assigned pickup day! Jeremy Blizard's buck was still in velvet. Kent Ware got this 8 point with his bow! Each week we will announce the prize for the week. Anyone who has a deer skinned and processed here at Cordray's is automatically eligible to win. Winners are determined by the highest dressed weight of the week. You must claim your prize when you pick up your meat. Each bag weighs 50 lbs. Stay tuned to this blog to see if you are one of our 20 winners! We will not have an overall yearly winner, just weekly winners. To receive your prize, you must pick up your meat within a week of the due date. If you have someone else pick up your meat, please be prepared for them to pick up your prize on that day. We are not able to hold prizes for you. Jordan Singleton held on to win last week's BUCK OF THE WEEK! Jordan wins a tanned hide from Cordray's Taxidermy! Jacob Murray got his first buck with a live weight of 165 lbs.